None of the big assassination stories of the 1960s—JFK, RFK, Martin Luther King, Malcolm X—really add up. The killing of the Kennedys and today’s new Cold War and war against terror are two ends of a linked intelligence operation. 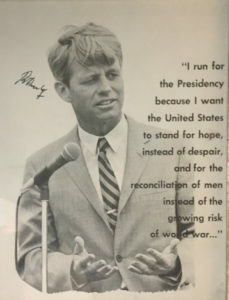 April 3, 2019 | When Senator Robert Kennedy was assassinated on June 5,1968, the American public fell into an hypnotic trance in which they have remained ever since. The overwhelming majority accepted what was presented by government authorities as an open and shut case that a young Palestinian American, Sirhan Sirhan, had murdered RFK because of his support for Israel, a false accusation whose ramifications echo down the years. That this was patently untrue and was contradicted by overwhelming evidence made no difference. Sirhan did not kill Robert Kennedy, yet he remains in jail to this very day. Robert Kennedy, Jr., who was 14 years old at the time of his father’s death, has visited Sirhan in prison, claims he is innocent, and believes there was another gunman. Paul Schrade, an aide to the senator and the first person shot that night, also says Sirhan didn’t do it. Both have plenty of evidence. And they are not alone. Edward Curtin is a writer whose work has appeared widely. He teaches sociology at Massachusetts College of Liberal Arts. Some suggest it will take a war to create an antiwar movement that demands change. But the wars are already ongoing. Our attempt to police the world has already proved too costly. Where is the Bernie Sanders or Elizabeth Warren of foreign policy? Many Democrats are positioning themselves to take on Trump four years from now. They’d be wise to seek leadership by demonstrating it. Help grow the movement! Share this story with your friends.